Here is a picture of the famous Keyhole (taken by me on a previous climb in 2003). 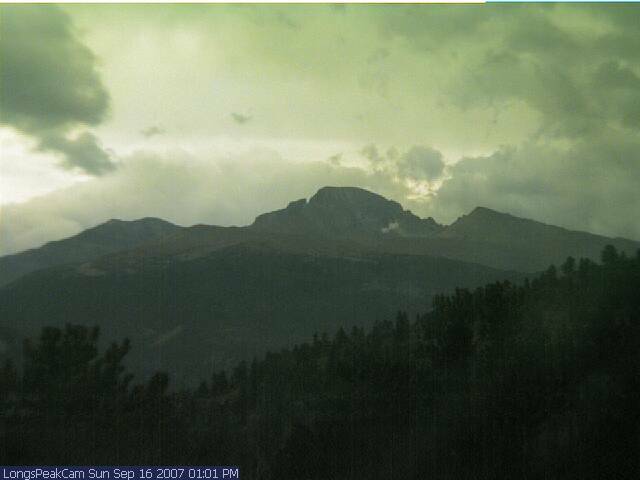 Last Modified: 7:40 PM, September 17, 2007 to add a picture of Longs Peak taken today from the summit of Flattop Mountain. 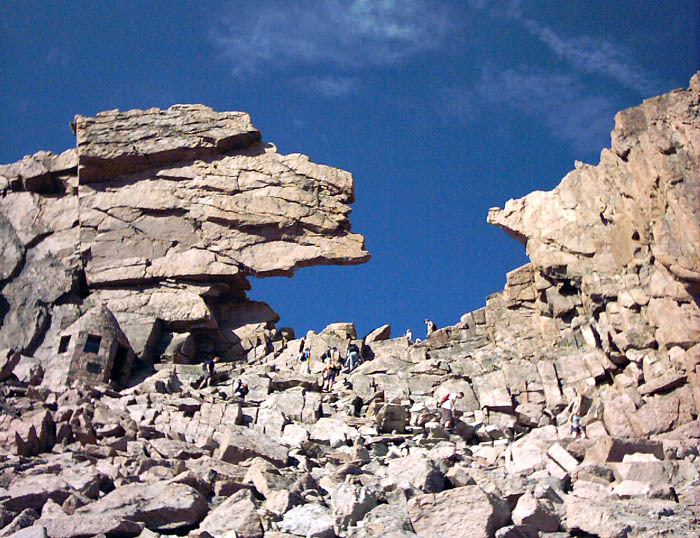 This is a trip report of my climb of Longs Peak (via the Keyhole Route). I climbed with my friend, Eric Sigler, who was doing the Longs Peak Duathlon (more about that later). Since this is now the 7th time I've climbed Longs Peak, I feel less of a need to take lots of pictures each time - I didn't even carry my camera on today's hike, so I'll have to paint some word pictures. They say a picture is worth a thousand words, so lack of pictures probably explains how this report got so long! Since I haven't yet written a proper trip report from any of my previous Longs Peak climbs, I'll make a stab at it in this one. I'll try to give you an idea of what it's like to climb this mountain, albeit from the warped eyes of a mountain marathoner. Please note that the time frames mentioned for passing the various points on the mountain probably only apply to you if are quick of foot and can run the Pikes Peak Marathon in less than five and half hours. If you aren't a runner, doubling these times (especially past the Keyhole) will probably give a fairer estimate of how long it might take to go from one point to the next. I won't delve into great depth about the route itself - you can read Gerry Roach for that, or better yet, read this detailed route description (with lots of pictures) at 14ers.com. Finally, I'll try to give insight about the weather information we used to help make our decision on whether to climb or not, and how this impacted what we took and did on the mountain. This climb was a bit different from any of my previous climbs - for starters, this was the first time I've climbed Longs Peak in September. Most of my previous climbs have been in the summer months of July and August, when the snow has melted, the Keyhole Route is considered nontechnical, and the only major dangers are falling off the mountain, having a part of the mountain fall on you, or getting caught in a lightning storm. In summer, the midday temperature on the summit can approach a toasty 60 degrees when the Plains are 100. A summer climb can start out downright warm (near 70), even in the predawn darkness. 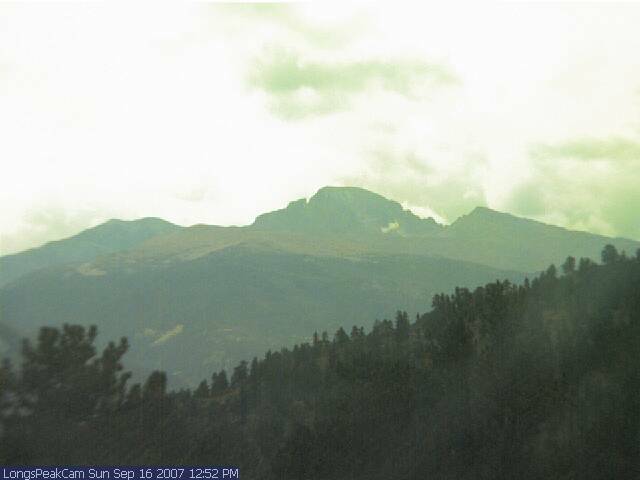 Although it is ill-advised, many climb Longs Peak in shorts and t-shirts this time of year. Some (typically the faster people) get lucky, but others (read: those who are slower or started later) get drenched and chilled by afternoon storms. By September, fall is definitely in the air, and weather systems regularly dust the high peaks with snow. This time of year often has fewer thunderstorms, but this is by no means guaranteed - the atmosphere doesn't always know that summer is over. The wind also picks up quite a bit from summer's doldrums, so the number of 'nice' climbing days diminishes rapidly. Sometime in September or early October, Longs Peak usually gets a large enough snowstorm that the snow and ice cover, well, key passages of the Keyhole Route, making the mountain technical for the rest of the year. Monday’s storm left a thin coating of snow and ice on just the upper reaches of Longs Peak and nearby Mount Meeker, most of this has melted off but there will likely be pockets of snow and ice on the colder aspects (north, east and west) and the National Park Service has upgraded the Keyhold Route which traverses many of these aspects to “TECHNICAL” due to the patches of ice that are covering parts of the route. Crampons or an ice axe are probably not practical for the spotty and thin nature of this ice, but careful footing and perhaps some more direct rock climbing in spots will be necessary to avoid this treacherous “verglas” covering of Longs most popular passage. Feeling optimistic that the snow would be melted by Sunday, we started making plans to climb. 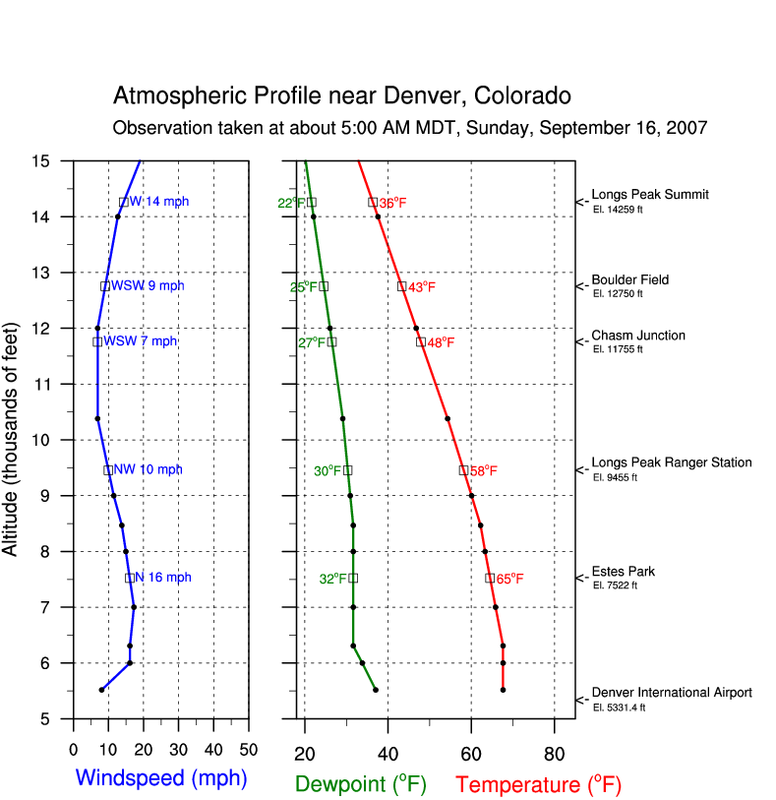 By Saturday morning, the forecast for Sunday was not nearly as nice - calling for wind gusts possibly as high as 60 - 70 mph for the gridpoint nearest to Longs Peak, valid for 13,000 feet (this links to current forecast for Longs Peak). I checked the models, and sure enough, a little wind streak was supposed to come through Sunday morning. But the models don't always get these subtle features correct. Additionally, my friend Suzette, who had been thinking of joining us, reported that the rangers were saying that the Keyhole Route was still technical as of Friday. Saturday night I looked at the Longs Peak Webcam and noticed fresh snow on the upper peak, apparently from a storm that afternoon. I was rather dismayed that a summit day was looking less likely - based on this information, I figured Eric and I wouldn't get past the Keyhole. But we decided to go anyway and just see how far we could get without putting ourselves in danger - if the weather turned out to be nasty, we could always just hike to Chasm Lake or the Keyhole. I set my alarm for 5:30 AM and quickly drifted off to sleep. Eric left his house at 5:20 AM, biking for about an hour in the darkness. Since I had been living the life of a late-night insomniac for the past month, it felt good to get up well before sunrise for once. I left Fort Collins at about 6:45 AM just as the sun was peaking over the horizon. The early morning light turned the slopes of the Big Thompson Canyon to a stupendous shade of orange as I drove up towards Estes Park. Both of us noticed the ominous, but beautiful orange and pink clouds billowing up from the Continental Divide - this convection, or buoyant overturning of the atmosphere, often leads to thunderstorms - seeing such clouds this early in the morning was a bad omen. Both of us were out of cell phone coverage though, so we were committed. We were going to meet at the trailhead around 8 AM no matter what. I arrived a few minutes early, but saw no sign of Eric so drove down the road to look for him. 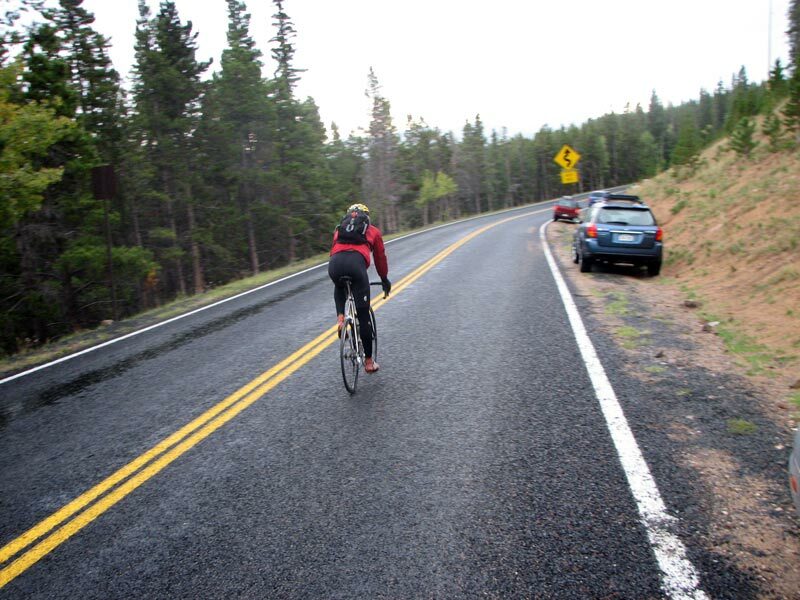 About 5 miles from the trailhead, I spotted him pedaling up the hill at a very impressive clip - he was looking strong! I drove back to the trailhead and started packing for the hike. 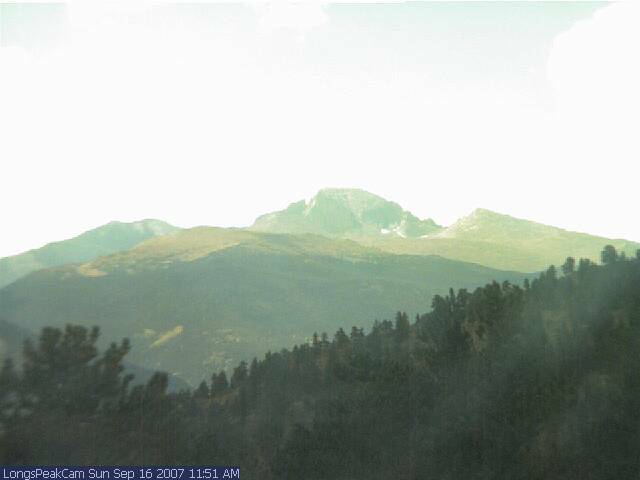 The morning forecast only called for wind gusts to 40 mph with a high near 52 at 13,000 feet. The chance of showers and thunderstorms was 20-30% from 8 AM onward, rising to a 50% chance after 1 PM. Since the weather was already looking iffy at the trailhead, I didn't skimp on clothing. I packed two technical long-sleeve shirts, a fleece jacket, a rain jacket/wind shell, and some (quasi-windproof) pants to pull on over my running shorts if the windy forecast verified. I also wore a hat, and packed a thin facemask, gloves, extra food, 70 oz of Gatorade. Just in case things got really desperate, I threw in one of those little shiny space blankets. I figure I could probably survive a windy night on the upper mountain with this gear/clothing ensemble, but it wouldn't be comfortable or fun. Eric arrives at the trailhead after his 42-mile ride up from Boulder. After chatting with the ranger (who informed us that yesterday the Homestretch had been turned into an 'ice skating rink' by the afternoon hail), we started hiking around 8:40 AM, a little later than we had planned. The weather was dubious: cloudy and cool with a momentary sprinkle. The cool air was pleasant though, and Eric and I made fantastic time as we climbed through the fir and spruce forest. Soon we were passing the goblin forest of stunted trees as climbed into the alpine zone. The sun was out and the sky was a beautiful shade of blue, but we wryly joked that ominous clouds must be lurking behind the ridgeline, just lulling us into a false sense of security. There was more truth to this than we would have liked, but we continued on blissfully unaware. We reached Chasm Junction (3.5 miles and 2200 feet of vertical climb) after only 1h03m. We continued the ascending traverse as the trail skirted beneath the shapeless hulk of Mount Lady Washington. Twenty-four minutes later we turned the corner at Glacier Junction, where the wind picked up noticeably, gusting up to about 30 mph. We stopped and donned an extra layer of clothing and grabbed a quick snack - it is important to keep providing energy to the body when doing such a long hike. Many people forget this in the first couple hours of a hike like Longs, but then they experience the dreaded energy 'bonk' where they feel too nauseous to eat or drink more. Their body goes into a reduced energy state and their pace slows drastically - this is not a fun situation to be in. Needless to say, as marathoners, both Eric and I take our energy intake very seriously on mountain hikes. As we approached the Boulder Field, we passed a few climbers coming back down - they had not summited, apparently due chilling wind and unpromising snow and ice in the Trough. We had experienced a couple wind gusts which may have approached 50 mph - definitely enough to blow you around, but not quite knock you over. But so far these had been very infrequent. We hit the Boulder Field at 1h56m into the climb, and twenty minutes later we were at the Keyhole. On the way there, we passed three girls coming down - they had made it all the way to the Narrows before turning back due to the 'wet, slippery conditions'. This was encouraging in a strange way because the Narrows are just before the Homestretch, and from there it's only about 200 yards to the summit. So it was good to hear of someone making it this far. Then we passed a group of climbers coming down, with full ropes and gear. We learned that they had summited, but had roped up for the Homestretch. It was really nice to hear that someone had summited, albeit with ropes. Eric was still climbing strong - our time to the Keyhole was a very respectable 2h16m. Needless to say, we were feeling like indomitable mountain men as we made excellent time over to the Trough, passing numerous people. Most of the people we were passing had probably started hiking at 5:30 AM or earlier - about the time Eric had left his house on bicycle! At the base of the Trough, a group told us that it wasn't that bad ahead, but that we had to really want the peak if we were going to make it. I guess they thought we were first-timers and were trying to encourage us. Maybe they were worried that we were still going up the mountain after 11 AM. We smiled and told them 'we really wanted it' and kept going. I didn't bother to add that this would be my 7th time and that I was quite familiar with the route ahead - sometimes it's fun to play the role of a novice and see what advice people offer. The wind at the Keyhole had been quite strong - a steady 25-30 mph with gusts probably approaching 45 mph. But for most of the rest of our climb, it wasn't really bad at all - maybe a few gusts to 25 mph. It was still mostly clear over the peak at this point, but clouds whipped by from time to time with incredible speed, distorting as they were warped by the flow around the summit. As we climbed the Trough (a wide 800-foot chute filled with rubble and boulders), Eric and I each dislodged a rock, giving a scare to some hikers below us. My rock was especially large - I was not proud of this turn of events, but it is hard not to knock rocks down in this stretch - there are gazillions of them perched on ledges just waiting to roll down. The best thing to do is stay on the route proper (marked on the rock with yellow and red bullseyes) - there the rocks probably have a greater chance of stopping. The upper Trough contained a bit of snow and ice, but with care, I was able to keep ascending on dry rock. I climbed out of the Trough and turned onto the Narrows, and low and behold, they route ahead was mostly dry! Some hikers were coming back through and I asked about the Homestretch - they said it was dry and added that I was almost there. When I saw the Homestretch (a 200 yard stretch of boilerplate slabs which lead up to the summit at a steep 30-40 degree slope), I knew that this was going to be a summit day! It was no dangerous than a warm, summer day, with only a hint of moisture in a few places. I looked at my watch and realized that a sub-3:00 ascent was within reach. I hoofed it up the Homestretch - I'm still not in good enough shape to run it, and after setting a blazing pace, I was feeling the thin air by about the halfway point. I stopped to catch my breath, then resumed at a more sustainable (but still vigorous) pace. 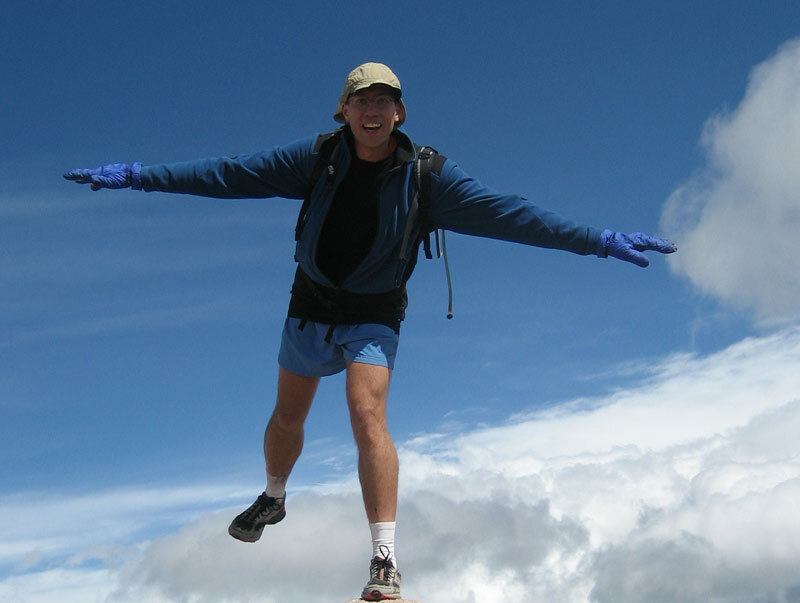 Here I am standing on the very tip top of Longs Peak (which is about as big as a football field). Much thanks to Linda Ripley for taking a picture of me! Seven minutes after starting from the bottom of the Homestretch, I was standing on the summit! My total ascent time was 2h56m. Only two other people were on the summit - a couple who promptly asked me to take their picture as soon as I appeared. They snapped a picture of me as well (but haven't sent it to me yet). 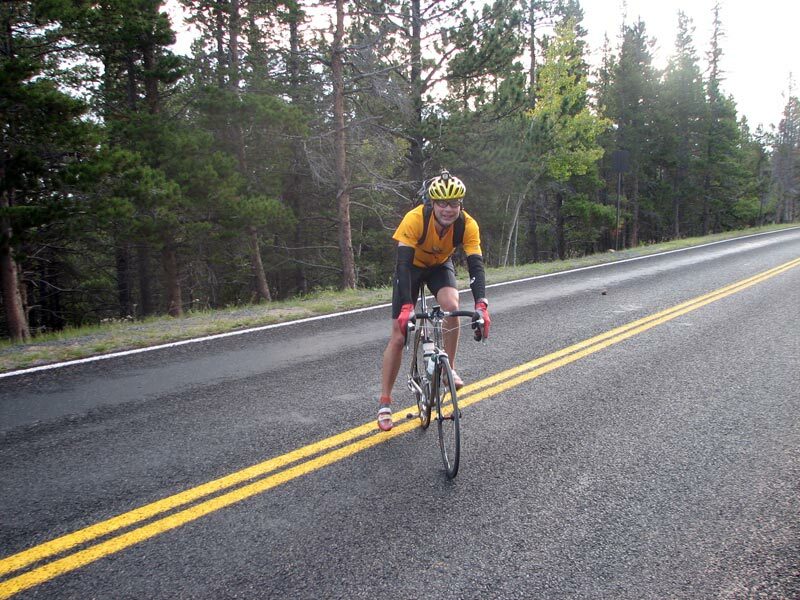 Eric popped into view from the rim of the Homestretch just as they were heading over to go down. It was a real treat to have the summit all to ourselves - the only other time I can remember the summit being this uncrowded was when Eric and I climbed the peak in April 2005 (and that day, I think we might have been the only ones on the mountain above the Keyhole). The weather was quite breezy (gusts to 25 mph) and it was a chilly 36 degrees, so we didn't stay long - just long enough to sign the summit register, put on another layer, and eat some more food. The views were great - although it was a bit hazy to the east, and clouds were building to the west - it was still a great day to be on top of Longs. Sometime I'll have to bring binoculars to see how much of Fort Collins I can see from the summit - I can't help but feel blessed to live so close to such a great mountain. Time for a crazy shot! Standing on a mountain makes me feel like flying. Maybe someday I'll get my flying squirrel suit and jump off and actually fly! Photo by Linda Ripley. After 13 minutes on the summit, we headed down. I really like going down the Homestretch - many people scoot down slowly and cautiously in a funny-looking crabwalk. If one were to fall, it could certainly be a life-ending event, as it the rock is steep enough that you might not be able to stop. After tumbling down a couple hundred yards, one might fly off the cliff beyond and into the abyss. But realistically, if you start sliding and just sit down, the friction of the dry rock will likely stop you. Anyway, I find it is much more efficient to just walk right down the slabs. I just try not to trip or slip. I skirted around some of the 'crabwalkers' and reached the bottom of the Homestretch in 5m25s. I felt like I took it fairly cautious because the rock was just a bit damp in spots - I did slip in one spot, with no ill effect. I think 3 minutes might be a really good time for descending to the bottom of the Homestretch, but that probably would be dangerous . . .
Coming down the Trough was quite a bit trickier than coming up - it was a lot harder to avoid the snow, and once our shoes were wet, the rock was much slicker. I slipped a couple times, and we saw another lady fall quite hard on her posterior. We took our time (comparatively speaking), but 21 min later, we were already to the bottom of the Trough. We passed (maybe the same) people sitting at the base of the Trough - they remarked that we must have been flying. I guess that would be true if they had been sitting there the entire time (what must have been close to an hour). We had some incentive to keep moving fast, as the clouds to the west were starting to darken. I figured that we would back to the Boulder Field before any real weather hit, but we didn't want to lollygag at this point and test this margin. Thirteen minutes from the base of the Trough, we were back to the Keyhole. About 15 min later, we hit the Boulder Field, and 26 min later put us to Glacier Junction. Between the Boulder Field and Glacier Junction, the clouds thickened up in a hurry and we heard rumblings of thunder. One hiker was still coming up - he asked me what time it was. I wanted to tell him it was time to get off the mountain, but I replied "It's one-thirteen." It's a free country after all, and I don't like to give advice to people when the situation is this obvious. I hope he turned around after what happened next. As we descended the north-facing switchbacks below the Boulder Field, an ominous wall of white moved quickly towards us - wind-driven graupel (ice pellets) began to sting our face. 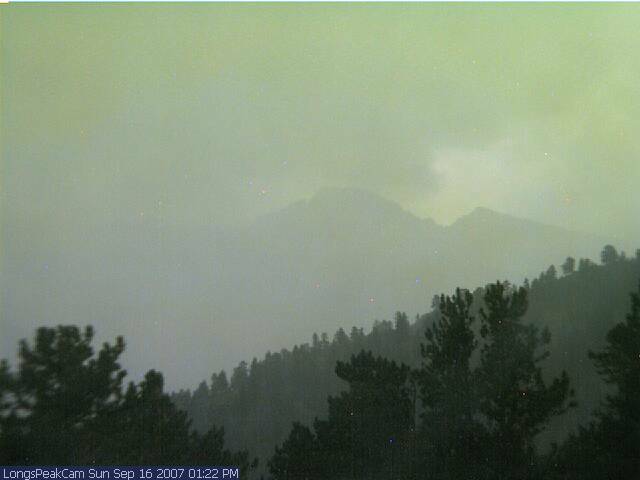 By 1:20 PM, the storm engulfed the peak. If anyone was still behind the Keyhole, their exit to easier terrain was now immeasurably more difficult and dangerous. 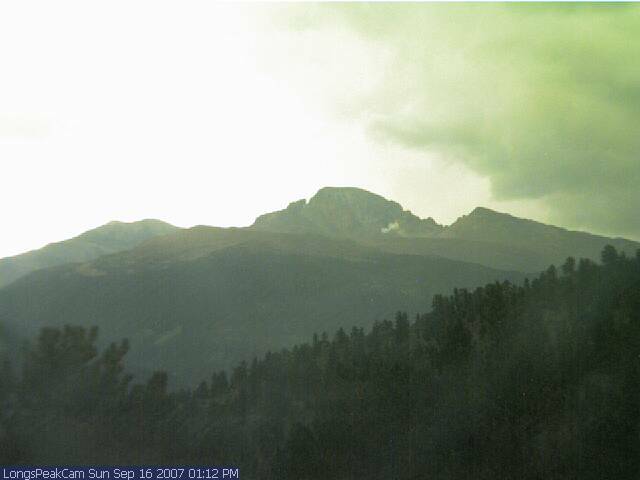 To get an idea of how quickly the weather turned, I saved some images from the Longs Peak Webcam, which looks southwest towards the summit of Longs from somewhere near Estes Park. This sequence covers from about the time we reached the summit, to when the storm hit with full force. We were already power hiking at perhaps a 12-13 min/mile pace after the Boulder Field, but after the storm hit we broke into a jog. Thankfully this only went on for about 10 minutes - as we got past Glacier Junction, and the ice switched to rain and then stopped for a while. It was much less windy and felt much warmer as well. Fifteen minutes later were reached Chasm Junction. We power hiked/jogged the last 3.5 miles in 42 min, reaching the trailhead at about 2:20 PM. A light rain filtered through the trees, just a few of which were showing their Fall colors (in Colorado, that would mostly just be one color actually - the brilliant yellow of the aspens). The temperature was 56 degrees, and this felt relatively balmy - at least until we stopped moving. 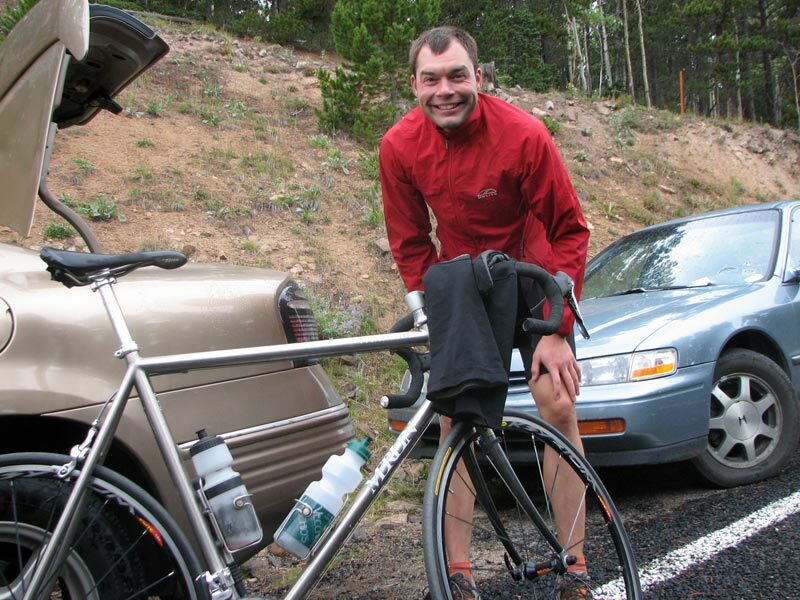 Eric transitioned back to biking mode, ate some more food, replenished his water stocks, and headed down the mountain. He didn't seem to excited about the prospect of the three more hill climbs he had left, but he was resolved to finish the Duathlon. I offered to give him a ride back in my comfy, warm car, but he turned down my offer without the slightest hint of temptation. The indefatguiable Eric readies his bike for the ride home. 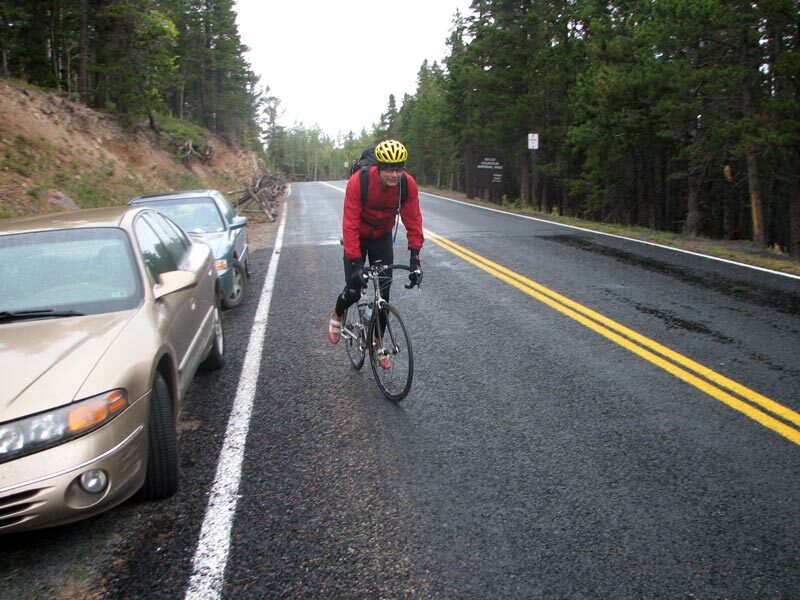 Eric starts his 42 mile ride back to Boulder . . .
. . . in the rain. I stopped in Estes Park for my traditional post-14er meal at Taco Bell, then drove down the canyon back to Fort Collins. At about 5:30 PM, Eric called me to tell me he had arrived back home safely. He said it rained almost all the way to Lyons - this sounded like a fairly miserable ride. I was pretty happy to have just done the hike today - that left me tired enough! This was my 7th successful summit of Longs Peak, and in retrospect, our timing today worked out just perfect. If we had started any sooner, we probably would have turned back due to slick conditions on the Homestretch. Any later and we would have gotten caught above the Keyhole in the storm. After climbing this mountain so many times already, I was a bit worried that I might get tired of it and relegate it to the realm of montañe mundane. Besides my previous 6 successful attempts, I can also count two unsuccessful attempts as well as numerous shorter hikes from this trailhead to Chasm Lake and Estes Cone. But at least for today, with the vagaries of the weather and uncertain conditions, Longs Peak retained its mystique - I look forward to going back again - it is just a spectacular place to visit. I've now climbed Longs Peak in four different months (April, July, August, and September). Each season brings its own set of challenges and discovery - I'm considering trying to climb Longs Peak in every month of the year - but this would involve a lot of winter alpine climbing. We'll see - I'm not committing to this yet . . .
Today's hike was my 2nd-fastest climb of Longs (eclipsed only by last year's 3h59m round-trip time - but that was running). My total time from start to finish today was 5h28m, comprised of a 2h56m ascent and a 2h19m descent. My previous fastest hiking time was a round-trip time of 7h01m45s (ascent of 3h59m, descent of 2h45m) way back on August 11, 2001. The standard Keyhole Route involves 15.0 miles, with 5000 vertical feet of climb. 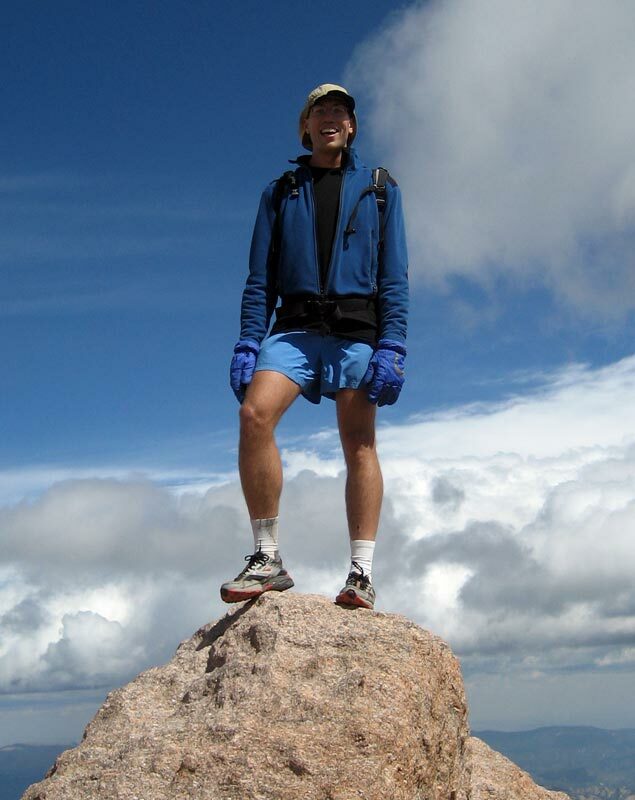 One of my running friends from the FortCollinsTrailRunners ran Flattop Mountain the day after we climbed Longs Peak. From there he took this spectacular picture of the summit covered in snow from a storm that hit the night after we climbed. 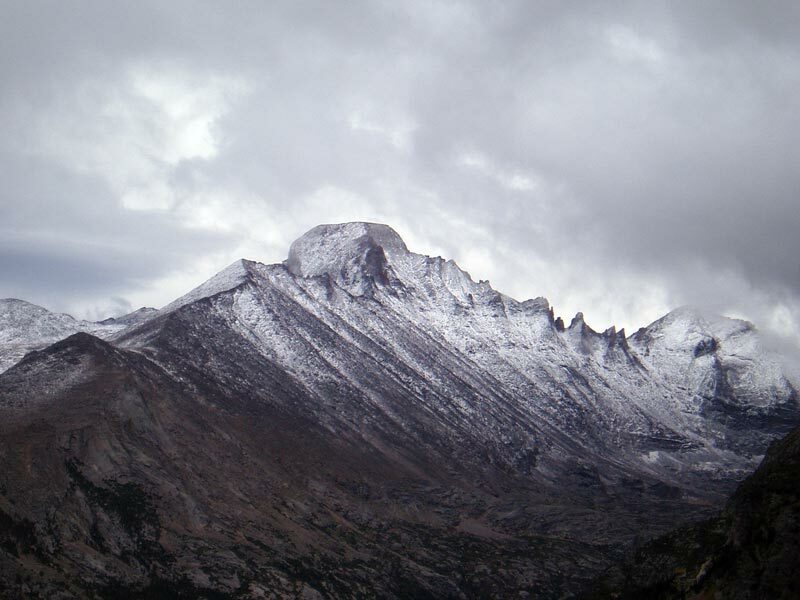 The summit of Longs Peak enshrouded in snow from an overnight storm, as seen from the summit of Flattop Mountain on the morning of September 17, 2007. The view looks southeast. Photo courtesy of Bryan Trammel. As you can see, the early morning temperature of 36 degrees matched very well with what we actually observed on the summit. On a sunny day, the summit temperature might exceed the sounding value by 10 degrees. The winds aren't nearly as strong, but this was about 7 hours before we were actually up there. 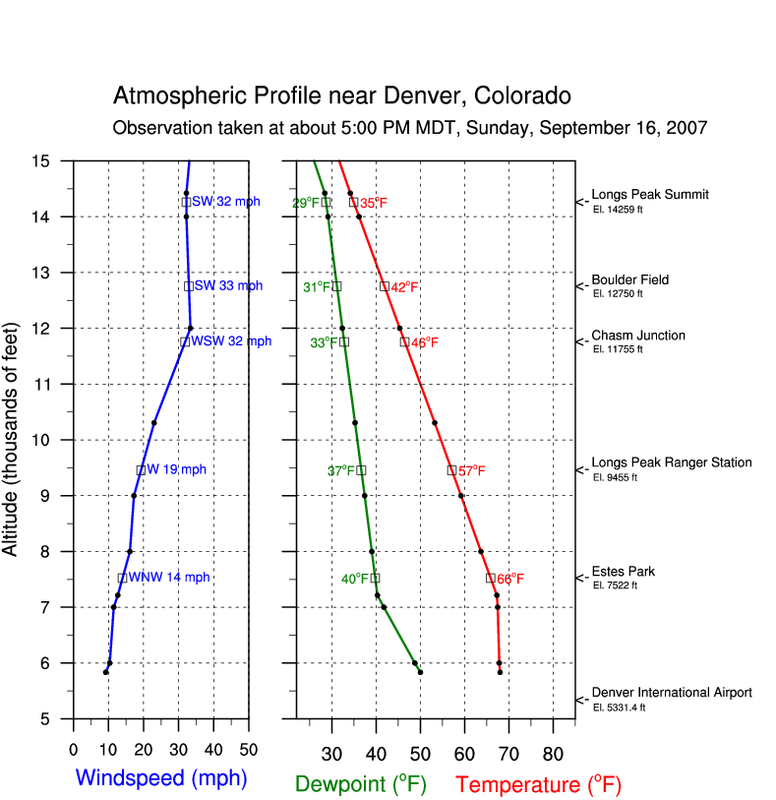 The winds can vary quite a bit locally as well in a downslope situation, so the winds over Denver are not always a very good indicator of what is happening on Longs Peak. The sounding from Sunday evening (about 3 hrs after we finished), shows higher winds, but temperatures were still very close to what we experienced. But now the moisture (indicated by higher dewpoint temperatures) is higher near the summit, likely indicating the presence of clouds up there. These plots show the weekly trace of peak wind gust and temperature from the D1 station on Niwot Ridge (~12,200 feet and about 10 miles south of Longs Peak). It looks like the afternoon storms caused a brief drop in temperature into the upper 30's, with a wind gust to 46 mph. This seems quite similar to what we experienced.